How Does an Electric Coffee Grinder Work? There is no common or widely-accepted standard for the amount of coffee to put in a coffee maker, and recommendations represent a range of preferences. Be aware that the more ground coffee you use, the stronger the coffee will be while a smaller amount makes weaker coffee. Sources report a range of suggestions that fall between 1 tablespoon per cup to 1 tablespoon for every 2 cups. The proper amount of coffee per cup is a matter of personal preference. Once again, the amount of coffee to use in your coffee maker is a matter of personal preference. In the case of a 60-cup coffee maker, it may also be a matter of how much coffee is at your disposal. The Coffee Aficionado website recommends using 1 tablespoon per 8 ounces or cup of coffee, which comes out to 60 tablespoons of coffee for a 60-cup machine. Another website, Coffee Classics, recommends 1 tablespoon per 2 cups of coffee or 30 tablespoons for a 60-cup coffee maker. 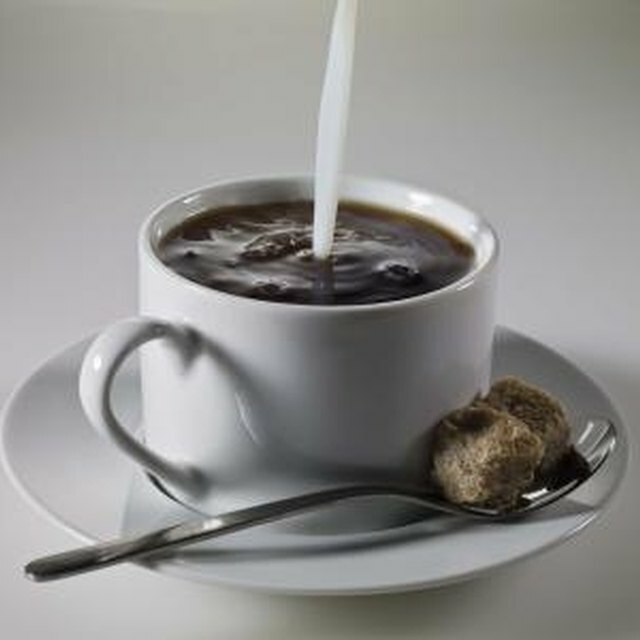 Coffee Classics and I Need Coffee recommend starting with 1 tablespoon for every 6 ounces of coffee and experimenting. Go from weak to strong or strong to weak over the course of a week and assess both your personal preferences and the reaction of others drinking the coffee, assuming that you won't be drinking all 60 cups. Then find a happy medium. Unfortunately, the very size of your coffee maker makes it more difficult to personalize your coffee taste and control the brewing process. The sheer volume of the ground coffee and water going through it may lead to uneven extraction -- the process by which the hot water carries coffee particles and oils into the liquid leaving the filter. A number of other factors play into how strong or weak your coffee is, not just the ratio of ground coffee to water. Most importantly, the quality of your coffee beans influences the taste, caffeine content and strength of the final product. Old, improperly stored or burnt beans give the final cup a weak and often sour flavor, regardless of the water-to-coffee ratio. Furthermore, make sure that the temperature of the water is just under boiling; colder water leads to under-extraction (sour and weak) while boiling water can scorch the grounds.